Expedition 49 flight engineer Shane Kimbrough of NASA, left, Soyuz commander Sergey Ryzhikov, center, and flight engineer Andrey Borisenko of Roscosmos at the launch vehicle processing facility in Baikonur, Oct. 13. Photo Credit: RKK Energia. After delays triggered by technical difficulties, the upcoming crewed mission to the International Space Station (ISS), designated Soyuz MS-02, is finally ready for its launch from Kazakhstan. The spacecraft, with the Expedition 49 trio aboard, will fly atop a Soyuz-FG booster at 4:05 a.m. EDT (08:05 GMT) Oct. 19 from Site 1/5 at the Baikonur Cosmodrome. The crew of Soyuz MS-02 consists of NASA astronaut Shane Kimbrough and Russian cosmonauts Sergey Ryzhikov and Andrei Borisenko. The start of the mission was initially targeted for Sept. 23 but was delayed due to a technical malfunction – a burned cable inside the spacecraft. In mid-September, the Roscosmos State Corporation originally announced the launch was rescheduled for Nov. 1. The gantry arms are raised around the Soyuz MS-02 spacecraft after it was placed into a vertical position on the launch pad, Sunday, Oct. 16, 2016, at the Baikonur Cosmodrome in Kazakhstan. Photo & Caption Credit: NASA / Joel Kowsky. Due to the delay, it was decided the crew needed to be sent back to the Gagarin Cosmonaut Training Center near Moscow to continue training until the new launch date got closer. Finally, some two weeks later, Roscosmos set Oct. 19 as the new date for liftoff. This decision allowed the primary and backup crews (consisting of Russian cosmonauts Alexander Misurkin and Nikolai Tikhonov, and NASA astronaut Mark Vande Hei) to return to Baikonur on Oct. 8 in order to resume final training activities at the launch site. The first check over of the Soyuz MS-02 spacecraft conducted by Russian engineers in late August did not detect anything suspicious and the vehicle successfully passed leak tests in the vacuum chamber. On Sept. 10, the teams performed closeout operations on the spacecraft and filled it with propellant components and compressed gasses in the fueling-and-neutralization area. Three days later, the spacecraft was mated to the transfer compartment and passed the designer’s inspection on Sept. 15. These operations cleared the space capsule for its encapsulation in a payload fairing and integration with the launch vehicle. However, an electrical short was discovered in the last test of the spacecraft. Due to issues with identifying the location of the problem, Roscosmos was forced to reschedule the launch of the mission. This was announced on Sept. 20. When the landing system cable that caused the problem was identified and replaced, the Russian State Commission restarted on Oct. 6 the nominal preparations for the flight. With the crews back in Baikonur, training sessions with the fully assembled spacecraft resumed. 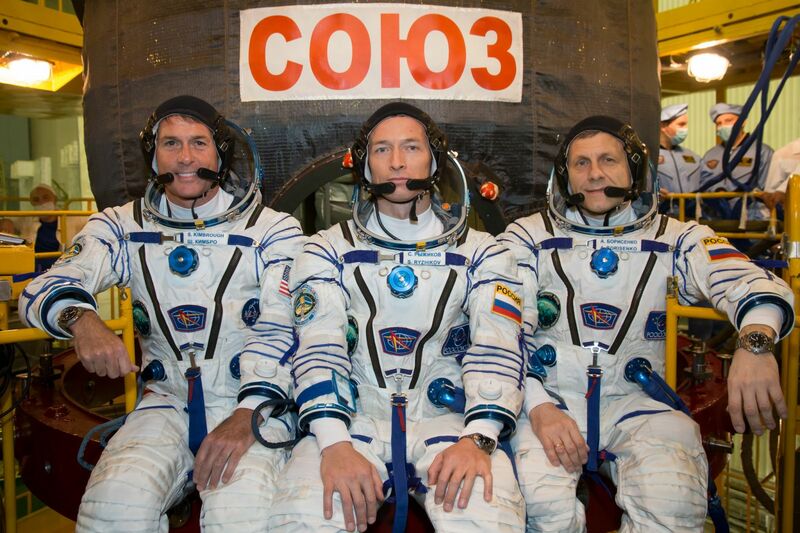 The crews had another chance to try on their Sokol-KV spacesuits, and after leak tests on the suits, they each took a seat in their spacecraft. Afterward, they tested the radio communications system and the laser range finder, read the onboard documentation, and studied the mission plan. From Oct. 10 to Oct. 13, the activities conducted in mid-September were repeated, including mating the spacecraft to the transfer compartment, designer’s inspection, and integration with the rocket. On Oct. 14, the Russian State Commission announced the Soyuz-FG booster with the Soyuz MS-02 on top was ready to be rolled out and erected on the launch pad. The rollout of the rocket took place on Oct. 16, which started final processing operations on the launch pad. Currently, a series of pre-launch tests are being run on systems and assemblies of the space launcher system. The engineers are also checking the interfaces between the onboard hardware and ground support equipment. After launch, the Soyuz MS-02 spacecraft is expected to commence a two-day trip to the ISS, during which it will orbit Earth 34 times while testing upgraded spacecraft systems. Docking with the orbital laboratory’s Poisk module is scheduled to take place around 5:59 a.m. EDT (9:59 GMT) Oct. 21. Hatches between the Soyuz and ISS will be opened at about 8:35 a.m. EDT (12:35 GMT). The new crew will be welcomed on by Expedition 49 Commander Anatoly Ivanishin of Roscosmos, NASA’s Kate Rubins, and Takuya Onishi of the Japan Aerospace Exploration Agency (JAXA). The Soyuz MS-02 mission is the first spaceflight for Ryzhikov and the second trip to space for Kimbrough and Borisenko. Kimbrough was a Mission Specialist on STS-126 in November 2008, during which he conducted two spacewalks. Borisenko flew to space aboard the Soyuz TMA-21 spacecraft in April 2011 and served as the commander of Expedition 28 during his stay on ISS. The new crew will spend a little more than four months aboard the ISS before returning to Earth in late February 2017. They are expected to carry out hundreds of experiments in biology, biotechnology, physical science, and Earth science aboard the station. Soyuz MS-02 will be the second mission of the upgraded Soyuz-MS spacecraft. The first Soyuz-MS vehicle, designated Soyuz MS-01, also suffered an anomaly that delayed its launch. The MS-01 mission, which transported Russian cosmonaut Ivanishin, Onishi, and Rubins to the ISS, was postponed from June 24 to July 7 due to a malfunction in the spacecraft’s system of traffic guidance. 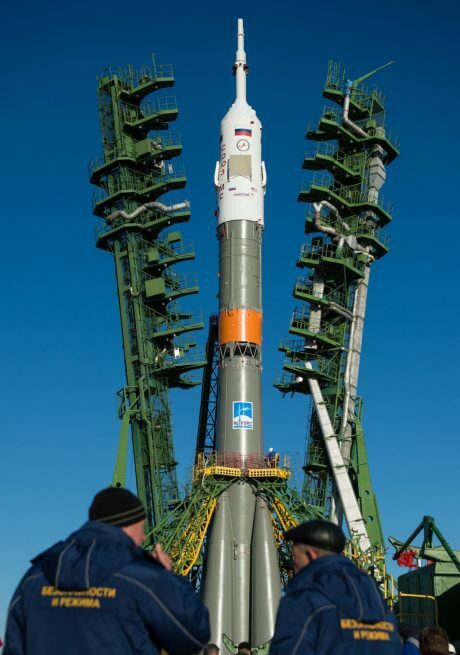 The Soyuz-FG that will be used for Wednesday’s launch measures some 162 feet (49.5 meters) in height and weighs an estimated 305 metric tons at liftoff. The rocket is capable of carrying more than seven metric tons to low-Earth orbit (LEO). It is a three-stage rocket that utilizes a core stage that burns throughout the first and second stage portions of the flight. Stage one is composed of the Core Stage and four strap-on boosters. Wednesday’s mission will be the 131st flight of a Soyuz spacecraft and the third manned mission to the ISS this year. The next crew, consisting of Russian cosmonaut Oleg Novitskiy, ESA astronaut Thomas Pesquet, and NASA’s Peggy A. Whitson, will be sent to the station on Nov. 15, 2016, aboard the Soyuz MS-03 spacecraft.